After a few years of Youtube showing the world how to do video on the web, lots of traditional broadcasters and studios have started putting their content online. Part of the reason is to try to steal YouTube’s thunder – a more market-friendly tactic than just lawsuits. Many of these sites are trying to figure out an advertising model and make money, while others are obviously trying to get viewers more engaged by joining social networks, making mash-ups, etc. But enough about their goals, what about user goals and experience? In web video the content may be king but usability is almost as important. If your user interface is difficult, confusing, or unpleasant, users will leave your site to get the content elsewhere. So I’m going to try to do a usability review of various web video sites over the next few weeks. These won’t be formal reviews with user tests and cool eye-tracking heatmaps. Instead I’ll point out some user goals and hold up each site to the same rubrick. So, what do users want out of web video? I can think of a number of scenarios: finding a particular clip or episode, watching recent episodes, sending a link to a friend or embedding a clip in a blog, and , well, just enjoying the show. Score: 4 out of 4 points. This site has everything – every show from every season. Method: I’m taking a cue from the creators of Friends – people don’t remember episode names. So I’ll be doing a Google search for the show name and “the one where” and taking the first relevant result. In this case it’s “the one where Ben Affleck has a relationship with Cartman’s Jennifer Lopez hand” (without quotes). Score: 2 out of 4 points. The search fails, but a simpler query for “Ben Affleck” leads us right to the clips. The full episode is available. How easy is it to watch videos? What’s the quality? Score: 4 out of 4. It’s immediately apparent what to click on to see an episode or clip. 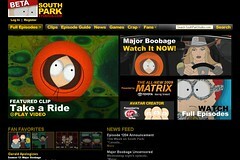 You can watch videos full screen and South Park’s animation lends itself well to compressed video. The navigation between episodes is pretty nice, with thumbnails of all episodes for that season along the bottom of the window. Score: 3 out of 4 points. The URL for each clip and episode is available by clicking the “Share” button. Clips open up in the main window so if you can get the link like any other web page. The only lost point is the fact the episodes open in new windows – what is the point? It takes away my browser toolbar and any social bookmaking toolbars or extensions I might normally use. Score: 3 out of 4 points. Once again use the Share button to get the embed code. They lose a point for not allowing embedding of full episodes – they probably have good reasons for not wanting users to do so, but we’re only concerned about the user’s side of things right now. Score: 3 out of 4 points. Ads are shown before the video (for clips) or at two break points about halfway through (for full episodes). Commercials are short and don’t obscure video or interrupt the show more than normal TV commericals would. They lose a point, though, because of the lack of variety – I watched a few episodes and plenty of clips and only saw two different commercials, over and over again. I’m going in go with a slightly different scale this time: introducing the patented Bleeding Ear Scale of Web Video Volume. You may have noticed that some TV stations play their commercials a little louder than the show. The theory I’ve always heard is that they want you catch your attention even if you get up to go to the fridge. Unfortunately, most people don’t watch web video the same way they watch TV – they’re usually sitting much, much closer to the speakers or wearing headphones. The bone-shattering difference in volume between the video and the commercials on SouthParkStudios.com earned the site four bleeding ears. Total score: 19 out of 24 points, with a special note to dive for the volume button whenever an ad is coming up. Note: this usability review as done as part of my graduate coursework at Kent State University. There is bound to be argument over what the primary, or first rule of usability is. But before any other rules or guidelines, a site must first satisfy the “zeroith” rule of usability: users must be able to get to the site. Go2Net fails this test because my.go2net.com is completely unavailable (Go2Net, 1). This is a problem first because competing sites already follow the my. [sitename].com URL convention (Welcome, 1). Worse, at one point my.go2net.com was a valid domain and had some amount of user recognition (Nasser, 1). This is especially bad for prospective portal sites, where the intention is that users will use the site as a launching point for the rest of the web. Anyone that had set their homepage to my.go2net.com has had to either update their homepage setting in their browser or pick a different site altogether. Portals need to seem stable and established–making major changes to a site’s navigation might counter that impression, but changing domain names around is even worse. Also, many users will only find Go2Net through links on other sites and pages. Although a Google search of sites linking to my.go2net.com comes up empty today (link:my.go2net.com, 1), Go2Net may have lost out on traffic from older links that have since been removed. Additional usability rules are easy to find, but there is no authoritative list. This paper will consider four guidelines from the textbook (Dumas, 56) and five from a popular usability site (Nielsen, 1).